When I first contacted Jerry Liguori about starting up a site dedicated to the study of the mythical “abieticola” Red-tailed Hawk (www.northernredtails.wordpress.com), I had no idea that I was embarking on a journey that was both a blessing and a curse. A blessing because many began to send messages/emails/comments along the lines of “thanks — a Red-tailed is no longer a Red-tailed anymore — I check every one!” and a curse because the field ID of subspecies is fraught with challenges….most esp. the field ID of a putative subspecies along a cline riddled with a great deal of individual variation (further blurring the subspecific ‘lines’). Further to this apparent ‘curse’ are my own identification blunders. What I called an abieticola Red-tailed in the winter of 2014 in some cases is not what I call an abieticola now. Note: What I find most interesting about the development of my own skill-set as a birder is my increased caution in the field, esp. when faced with the need (or urge) to take identification one step further and make subspecific determinations. A few years ago, I would have thought the opposite to be true at this stage in the game! 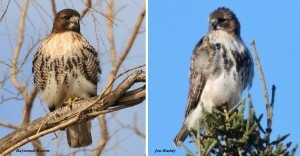 Figure 1: Above are two photos of Red-tailed Hawks. 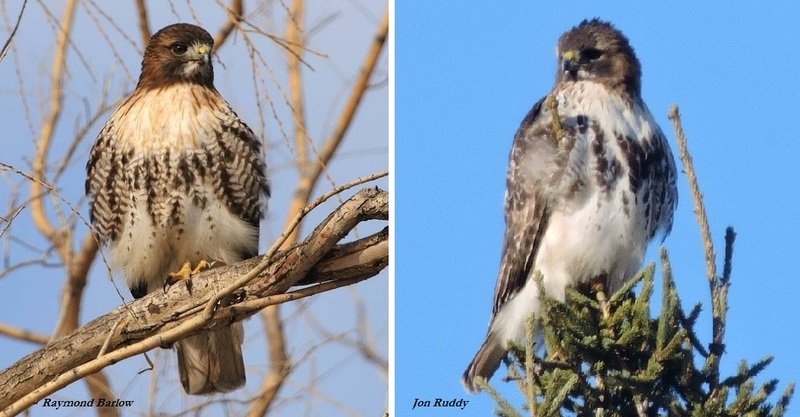 At left is a picture-perfect example of a lightly-marked Nothern (abieticola) Red-tailed Hawk. The identifiers of note are: dark, auburn-coloured head with golden streaking throughout; golden brow; well-marked throat (variable); reddish bloom to the breast; thin streaking overlain; belly band composed of globular, blackish markings and interwoven with a herringbone pattern throughout. At right is a modestly-to-heavily marked Eastern (borealis) Red-tailed Hawk. The identifiers of note are: brownish-blonde head with a constrastive dark malar and brow; blondish eye arcs to posterior of eye; throat is well-marked in this example (variable); breast and chest lack the reddish bloom (variation to this trait); minimal streaking to the sides of the breast; belly band composed of globular, blackish markings with limited herringbone interweave.